French Talmudist of the end of the thirteenth century. He carried on a learned discussion with Samson of Chinon and Eliezer ben Joseph of Chinon regarding a document that had been antedated—a question which was laid before Solomon ben Adret also. He was reputed to be an eminent Talmudist, and numbered among his pupils Eliezer (father of the author of "Minḥat Yehudah") and also the anonymous author of the commentary on the Pentateuch contained in MS. Hamburg No. 40 (comp. "Monatsschrift," 1881, p. 313). 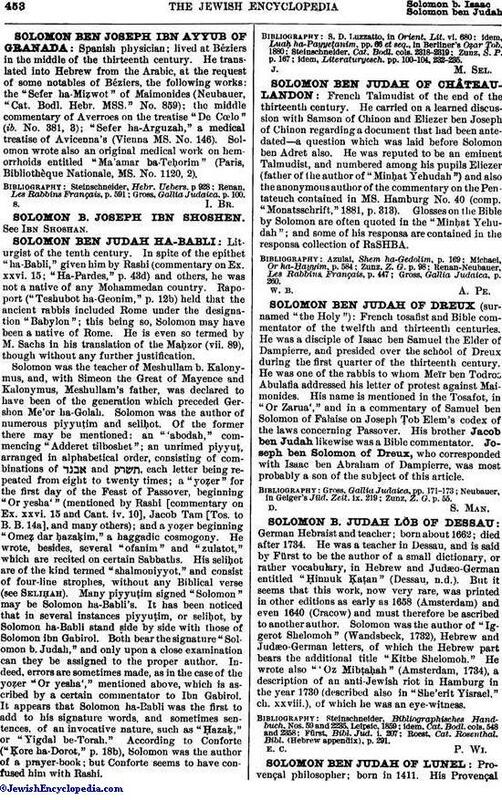 Glosses on the Bible by Solomon are often quoted in the "Minḥat Yehudah"; and some of his responsa are contained in the responsa collection of RaSHBA. Gross, Gallia Judaica, p. 260.